Faby picked up the win when Estrella Divina betrayed Shani. Faby is still being mean to Ashley. first defense. Suicide won with his fireman's carry gutbuster. Suicide attacked Vikingo with the belt after the match, Angelikal made the save. Maximo sent an open challenge to anyone to face them, which led to a half dozen unidentified local wrestlers coming to the ring. Maximo said he was joking, but they attacked and beat up his and his cousin for minutes before they made the comeback. Appeared to be an official match with a referee and all, though strange. made a title match, and Parka Negra was a Perros del Mal member in Mr. Aguila's absence. First defense. Crowd brawl, ending with one member of each team being pinned at the same time after being fouled. Piero ruled it was a draw. 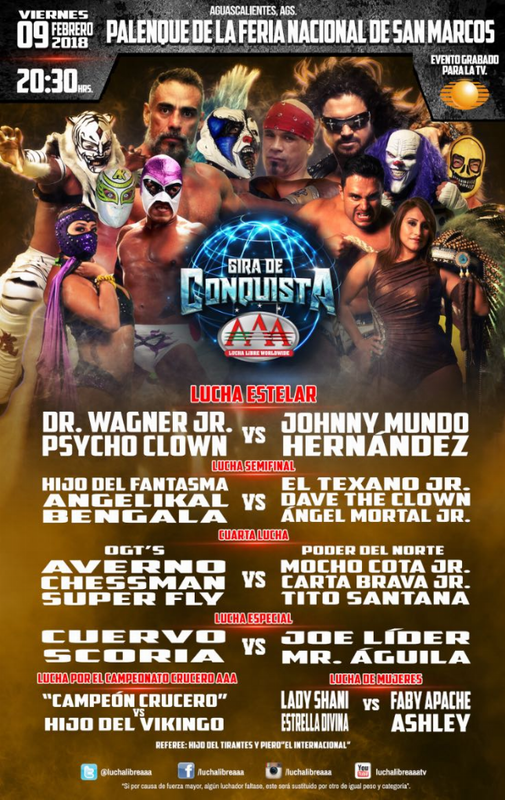 Vampiro forced both teams to accept a TLC (and lamps) match for Rey de Reyes with the trios titles on the line, and it will be the last match between tehse two teams. Money thrown in. switched to a tag match (Angel Mortal & Bengala dropped). Vampiro tried to eject Tirantes as referee but the commission overruled Vampiro and let him stay. Tirantes attacked a security official and took handcuffs to tie Fantamsa to the bottom rope while they destroyed Angelikal. Angelikal bled heavily and was strechered away. Bengala made the save (which was apparently a DQ), though he was also put thru a table before Fantasma made his comeback. Switched from a Wagner/Psycho vs Hernandez/Mundo tag match. Mundo did not appear, and was only mentions as the person Wagner beat to win the title. 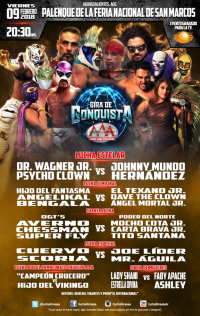 Parka was DQed when Blue Demon, Hernandez and Hijo del Wagner attacked him (you read that right), AAA recap says Parka was about get the win. Wagner thought the Demon group was on his side, only for them to attack him too. Scoria, Cuervo, Shani, Vikingo, Maximo, Mascara, and Psycho Clown all tried to make the save and were beat up (Psycho unmasked.) Demon was revealed to be the reason/person who convinced Hijo del Wagner to go against his father.